Visual Studio Code>Other>Live Share Extension PackNew to Visual Studio Code? Get it now. Collection of extensions that enable real-time collaborative development with VS Live Share. If you're not already familiar with Visual Studio Live Share, refer here for more information. This extension pack includes everything you need to start collaboratively editing and debugging in real time, including integrated audio and text chat. This provides you and your team/class with a one-click installation, in order to begin pair programming, performing remote code reviews, driving interactive lectures, and more, without needing to leave Visual Studio Code. Open your project, then click the Live Share button in your status bar to start a new collaboration session. You'll be asked to login with your GitHub or Microsoft account the first time, which simply allows other developers to identify you. Refer to the Live Share quickstart for more details. Refer to the Live Share Audio quickstart for more details. A new document window, titled Live Share Chat, will automatically open to the side. This window provides you with an integrated chat channel that is scoped to the guests in your collaboration session. If you close the window, you can always re-open it by clicking the Chat Channel node in the Live Share Session Details view (as displayed below). Refer to the Team Chat quickstart for more details, including how to use an existing Slack or Discord workspace for integrated chat. 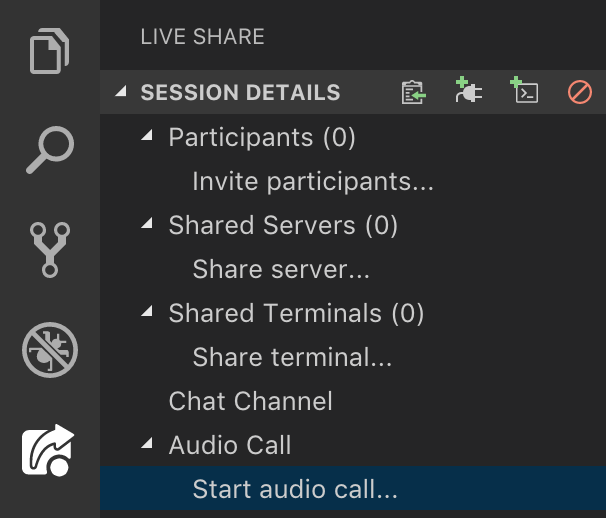 When you send the VS Live Share link to another developer, they'll immediately join into your session, and will be prompted to connect to the audio call. From there, you can begin communicating and collaborating in real-time, without needing to rely on any other tools or services. To learn more about what you can do with VS Live Share (e.g. co-debugging, sharing terminals and localhost servers), refer to the comprehensive how-to guide.